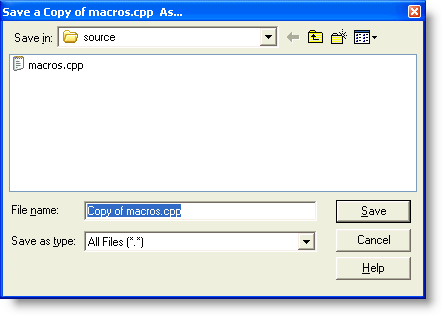 The Save a Copy As command is used to save the current file to disk under a new filename. A standard File Save dialog box will appear so that a new name can be specified. Unlike the Save As command, the editor does not record the new filename for use by future save operations. This command can be useful for creating progressive copies of a file during a long edit session so that a change history is created, or at anytime when a copy might be useful.